Looking for the perfect rimfire training rifle, one that has the look, feel, and ergonomics of your favorite centerfire field/tactical rifle? Well here’s a unique opportunity. EuroOptic.com is putting together a special limited edition run of 49 Sako Quad rifles, configured exactly as the buyer specifies, with McMillan Stocks, Lilja Barrels, and Cerakoted Metal. There will only be 49 such rifles available, and the deadline to order is July 31, 2012. EuroOptic.com has a few offerings left, but it expects all 49 Special Edition Quads will be sold by the end of this month. 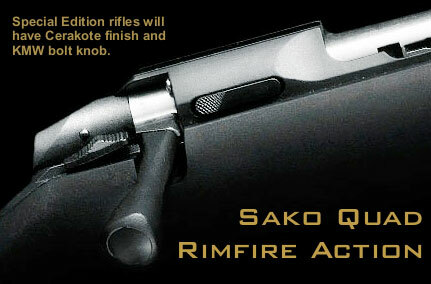 The Sako Quad was a great concept — one rimfire rifle with a quiver of barrels in different rimfire chamberings. However, many potential buyers didn’t need or want all four barrels. Many potential buyers liked the idea of the Quad as a rimfire trainer, but they wanted a rifle fitted with a full-size, fiberglass stock, so the gun would have the same ergonomics and feel as their centerfire bolt-guns. That would make it the ideal rimfire training rig. Well, this dream is now a reality. EuroOptic.com has decided to make a special limited run of 49 custom rimfire trainer rifles with premium components. These Special Edition Quads will feature Sako Quad actions, McMillan fiberglass stocks, Lilja custom barrels, as well as quality third-party scope rails, triggerguards, and bolt knobs. The bedding and coating work will be done by GA Precision. Each rifle will be “made to order” for the 49 lucky guys who sign up before orders close. The pre-order price (including ONE barrel, no optics) is $2195.00 + $30.00 for insured shipping in a hard card. Those who pre-order the rifles will be able to select the colors and special features they prefer. Buyers can chose among six (6) different McMillan stocks (with your choice of finish). Each rifle comes with one (1) .22 LR barrel. For an additional $350.00 per barrel, you can also order extra Lilja barrels chambered for any of these rimfire cartridges: .22 WMR, .17 HMR, or 17 Mach 2. SAKO Quad receiver engraved with EuroOptic Logo and 1 of 49, 2 of 49 etc. Lilja custom drop-in bull barrel in .22 LR. Other barrels/calibers can be added. McMillan stock of your choice, bedded by GA Precision. Cerakote metal color of your choice: Black, Desert Tan, Mil-Spec OD. Picatinny +20 MOA scope rail by DIProducts. Billet Aluminum trigger-guard by DIProducts. You can choose from a variety of popular McMillan fiberglass stock designs. These include: A2, A3, A3-5, A5, HTG (M40), and Sako Varmint. The purchaser can also select the stock color/pattern. Click here to view some stock color options. To order, call EuroOptic at (570) 220-3159 or email: alex [at] eurooptic.com . When ordering, please specify McMillan stock model and color choice, as well as any extras you would like (including additional barrels), along with your choice of metal color. NOTE: Eurooptic.com requires a 25% non-refundable deposit for these rifles. Once the deposit is taken, the stock will be ordered as specified. The Quads are to be delivered by Sako in August 2012, and all 49 rifles should be completed before the end of 2012. Eurooptic’s special pricing will continue until all 49 rifles are sold or until JULY 31st, whichever comes first. July 31st is the last day to pre-order a rifle to your spec. If any rifles remain unsold at that point they will be sold at normal price reflected on the Eurooptic.com website. Share the post "Sako Quad Rimfire Trainer — Buyer-Configurable Special Edition"
Carl Zeiss Sports Optics has made its top-end spotting scopes much more affordable. From August 1, 2012 through the end of the year, Zeiss is offering a whopping $500 rebate on its 65mm and 85mm Victory DiaScope spotting scopes. Those who purchase a DiaScope during this time will also receive a free portable tripod to enhance their viewing pleasure. 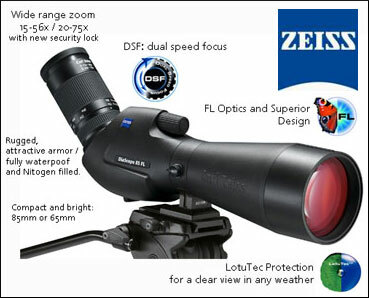 This rebate offer is part of the Carl Zeiss 2012 Field Days Promotion. Visit Zeiss.com on August 1st for full details of the DiaScope promotion and other Field Days special offers. The current Zeiss DiaScope models were launched in 2010 and won Field & Stream’s Best of the Best award, Outdoor Life’s Editor’s Choice award, Petersen’s Hunting’s Editor’s Choice award and the prestigious international Red Dot Design Award. It has many impressive features, including one-piece construction, full armor, and an innovative Dual Speed Focus System (DSF). For those seeking extreme magnification, the DiaScope has an edge over other premium spotting scopes — MORE POWER. The DiaScope’s 20-75x eyepiece remains the most powerful on the market today. We have tested the latest Zeiss 85mm DiaScope against high-end scopes from Swarovski, Nikon, and Pentax. Viewed at equivalent 60 power, the Zeiss glass was sharper, brighter, and clearer than both the Nikon and Pentax (showing less chromatic aberration). Contrast and sharpness was very, very close to the Swarovski, with possibly a tiny edge to the Swaro in contrast. Some of our testers prefered the DiaScope’s Dual Speed Focus. It is definitely fast. Others preferred the simplicity of the big, full-diameter ring on the Swarovski. But when we wanted max magnification, the DiaScope offered significantly more power than the Swaro: 75X for the Zeiss vs. 60X for the Swaro. Advantage Zeiss. How about price? A Swarovski ATM-80 HD (Angled) with 20-60X eyepiece currently costs about $3059.00. The Zeiss Victory DiaScope 85T FL (Angled) with 20-75x eyepiece retails for about $3150.00 before rebate. If you knock $500.00 off the Zeiss with the rebate, you can get the 85mm Zeiss DiaScope for $409.00 less than the 80mm Swarovski. That should secure more buyers for the Zeiss. But anyone looking at ultra-premium spotting scopes should also consider the 88mm Kowa TSN-883/884 Prominar with Fluorite Glass. The Kowa is superb — perhaps the new benchmark for 80+ mm class spotters. The 88mm Angled version is $2450.00 for body only. CLICK HERE for Kowa TSN-880 Series Gear Review. Share the post "Zeiss Offers $500.00 Rebate on DiaScope Spotting Scopes"